I try to show at least one cheaper puzzle for you at least every other week so that I don't exclude people who can't afford the bespoke toys. Puzzling is supposed to be an inclusive hobby in which all can join in. If you can't afford the expensive bespoke puzzles then do try to find and attend a local puzzle party if possible - you will make a lot of friends and get a chance to play with stuff that is either hard to find or out of your normal price range. Whilst on the subject of puzzle parties - I hope that everyone attending the annual King's day puzzle party at Wil Strijbos' house have a great day - I hope one day to be able to join you. Today I have already shown a beautiful Turning Interlocking Cube which is easily within most people's reach and now I will follow up with another 2 puzzles that you can afford. First up is the Cast W-U. I got this from Puzzle Master as part of my attempt to complete my Hanayama collection. I have a large number of them and this one had intrigued me for a while. It is rated as level 3 on the Hanayama 6 point scale and level 7 (Challenging) on Puzzle Master's own scale of 5 to 10. I actually disagree with these ratings and feel it should be at least one point lower on the scales. It is based on the classic Horseshoe puzzle which, let's face it, all puzzlers either own a copy of or have played with as a kid. I have 2 copies and, whilst it is no challenge to me, it is still fun to give to non-puzzlers as they remember that they've seen it but cannot remember what to do. Gabriel certainly seemed to enjoy it! Again, beautifully packaged by Hanayama in their black box, it comes out as a lovely antiqued brass looking puzzle with dimensions 11.9 x 3.8 x 3.8cm. 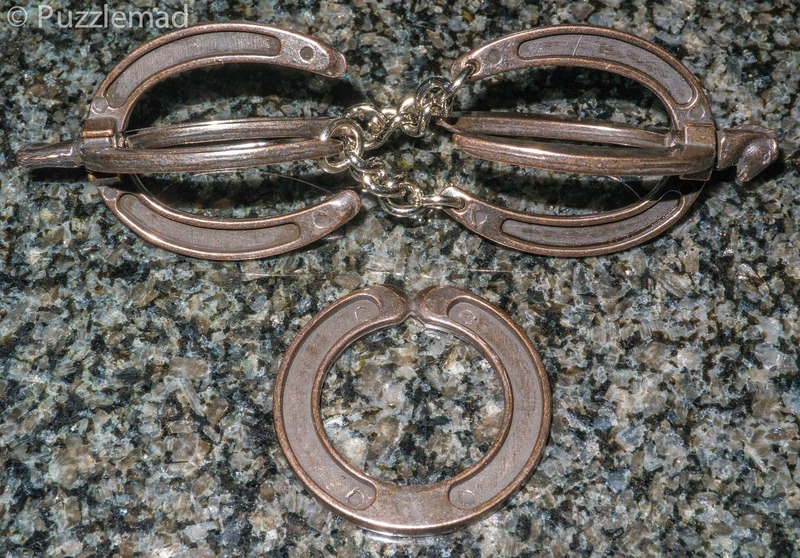 The W-U looks very similar to the original horseshoe puzzle but is made more complex by the fact that instead of 2 chain linked horseshoes there are 4 with pairs at 90º to each other and each pair is capped by a horse's head. The ring is another horseshoe made into a complete ring. No solution is provided and I very much doubt you will need one but it is available to download from here. I have given this to a few friends and all have solved it without too much difficulty but all thoroughly enjoyed it. The complete puzzle newbie remembered her childhood version but got a bit confused with the extra pieces on this one but still managed to work out what to do. One of my colleagues whom I have been torturing for quite some time quickly worked it out but immediately commented on the notch in the ring and asked whether it was significant! He's getting trained slowly!!! 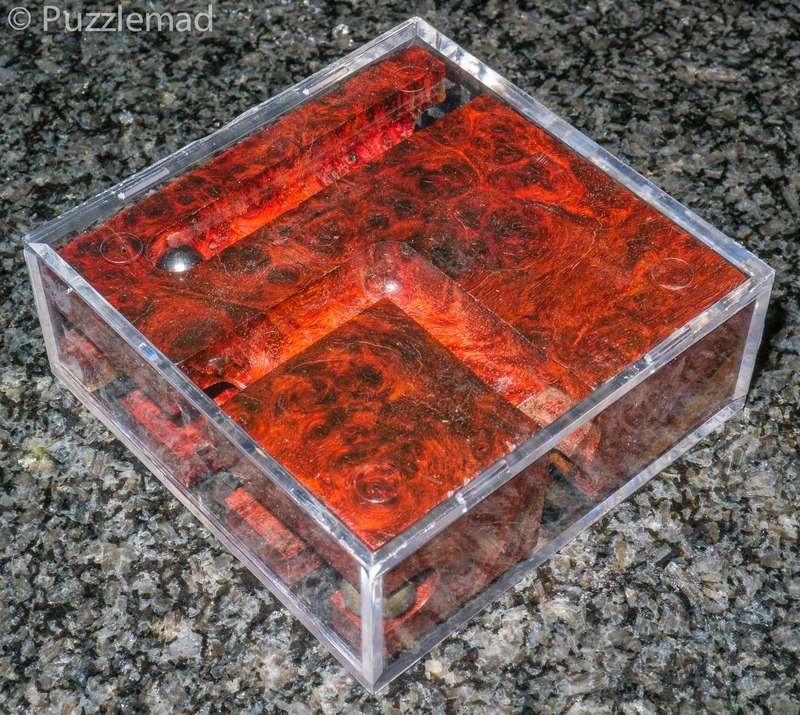 This is certainly a puzzle that any collector should own and is well worth buying if you are a new puzzler or planning on challenging some new puzzlers or children. Certainly at $13 it won't break the bank. Next up prepare for something absolutely beautiful which is still affordable! Some time ago I told you about about a new Kickstarter project by my friend Marcus - he produces mazes in various shapes and sizes out of the most gorgeous woods! He achieved his Kickstarter goal and sent out the mazes. I had put my money where my mouth is and this little beauty arrived. 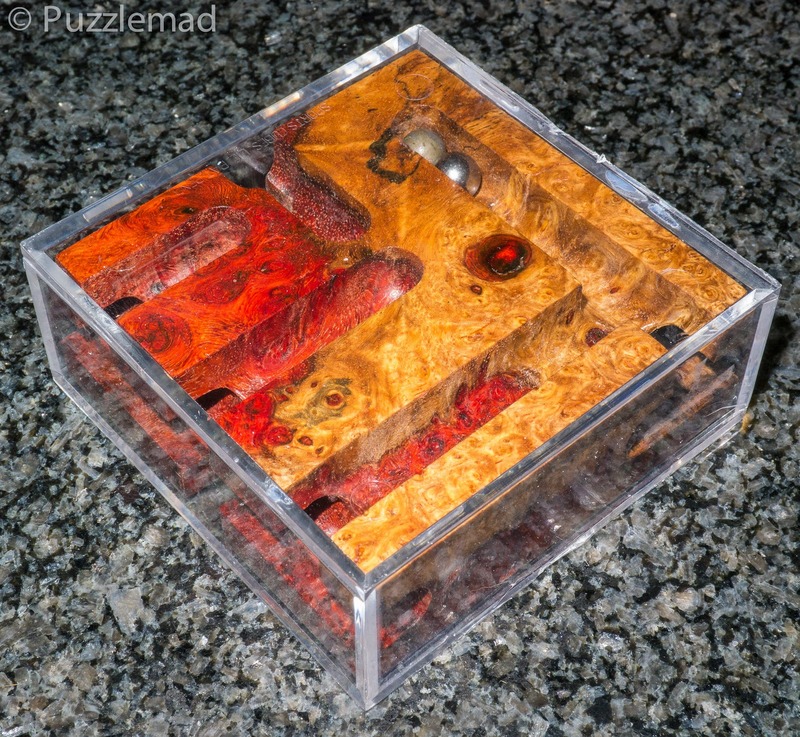 It is the revealed version of the mini maze burl made from Amboyna - one side is a magnificent deep red and the other is a mixture of lovely brown and the red with the fabulous burl markings. Thank you mate, it is sitting next to me on my desk looking fantastic. The mini version certainly is easier to play with! Not wanting to stop there, Marcus has set up a new Kickstarter project and I urge you to go and take a look - he has some fabulous burl woods to choose from (I am currently drooling over the incredible Flame box elder) and some new ideas for different shapes. You won't regret it! I don’t yet own a puzzle by Marcus but seriously love the Burls. Hopefully get one by the end of the year. They are gorgeous Dave, you will love them. Start by challenging yourself with a hidden version! My Pocket Revealed Maze should arrive very soon, hopefully by end of this week! Can't wait! You won't be disappointed! It is a lovely little thing! Hmm, I am very tempted to get one of the new ones listed on Marcus' Kickstarter site!